In this video Mark Donovan of HomeAdditionPlus.com reviews The Home Depot’s Pro App mobile device tool. The Home Depot has introduced to the market a new high tech mobile apps tool called “Pro App” for professional builders, contractors, and remodelers. Over the past few weeks I’ve had a chance to evaluate the tool and have been extremely impressed with its features and benefits. 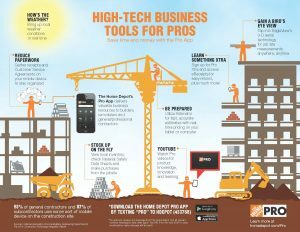 The Home Depot’s “Pro App” provides advanced technology in a system of easy-to-use, efficient tools that improves the effectiveness of professional builders and contractors on the jobsite. The Home Depot Pro App was designed based on the needs and requirements of actual professional builders and contractors. In today’s modern world where 93% of general contractors and 87% of subcontractors use some sort of mobile device on jobsites, it is not surprising that a strong need exists for the Pro App tool. In a recent market research study 58.9% of construction professionals said mobility is important when considering IT solutions. The Home Depot’s new mobile app “Pro App” is built with a robust suite of useful and customizable features that improves the efficiency of professional contractors. Moreover, it is designed to streamline key processes specifically identified by the construction industry pros. As a result, the “Pro App” ultimately saves them and their customers’ time and money. The “Pro App” makes it easy to take everything you need on the road. From receipts to in-store product availability, the “Pro App” has you covered. It reduces paperwork on the job site by allowing you to gather and store receipts and customer service agreements on your mobile device so that you can stay organized and have a paper free work truck. The “Pro App” also enables you to quickly check your local Home Depot store’s inventory for materials you need on the job site. In addition, you can check Material Safety Data sheets and even make purchases right from the jobsite using the “Pro App”. I find, in particular, the ability to make purchases while on the job site highly useful. Via my iPhone I am able to order and purchase material from the jobsite and check to see if the material is ready for pickup. As a result, I don’t have to spend time searching for materials in the store and standing in line to pay for them. I simply walk up to The Home Depot’s Pro desk and pick up my order. Fast and efficient! The app also allows you to access Pro Xtra, The Home Depot’s loyalty program for Pros, from anywhere, linking you to personalized information at the touch of a button. Professional contractors and remodelers can also get a bird’s eye view using the The Home Depot’s Pro’s EagleView 3-D aerial technology for job site measurements anywhere, anytime. Lastly, the Pro App provides local weather conditions real time so that you can plan accordingly when heading out to the job site. The “Pro App” is free and can be downloaded on iOS and Android systems or by texting “PRO” to HDepot (433768). So if you’re a professional contractor, builder or remodeler download it today to your mobile device and begin improving the efficiency of your business. Disclosure: The Home Depot partnered with bloggers such as me for their Pro Technology program. As part of this program, I received compensation for my time. They did not tell me what to purchase or what to say about any product mentioned in these posts. The Home Depot believes that consumers and bloggers are free to form their own opinions and share them in their own words. The Home Depot’s policies align with WOMMA Ethics Code, FTC guidelines and social media engagement recommendations.